Rasmussen Reports, an electronic publishing firm specializing in public opinion polling information, today released new statistics showing U.S. Senate candidate Mark Begich winning the Alaska Senate race by nine points. The poll, a telephone survey of 500 likely voters, shows Begich beating Sen. Ted Stevens 50 percent to 41 percent. According to Rasmussen Reports, when "leaners" are included, Begich leads 52 percent to 44 percent. The survey was conducted on July 17, nine days after Begich's first TV ads hit the air. "As more and more Alaskans learn about Mark Begich and his commitment to Alaska families, they're responding to the honest, ethical, results-driven style of leadership he offers," said Heather Rauch, campaign manager for Alaskans for Begich. "Polls are just one indicator of voter attitude, but we're pleased to see Mark is connecting with Alaskans and offering solutions to the challenges they face." 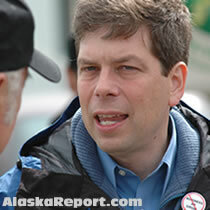 The Rasmussen poll gives Begich a 63 percent favorable rating, with 34 percent unfavorable. By contrast, 48 percent of Alaskans have an unfavorable view of Stevens. The poll also shows one in five Alaskan Republicans are supporting Begich. Alaska's U.S. Senate race between Republican incumbent Ted Stevens and Anchorage Mayor Mark Begich has been a toss-up for several months now, but the Democratic challenger is now ahead 50% to 41%. When "leaners" are included, Begich leads 52%to 44%. Begich began running his first television ads of the campaign on July 8 and the survey was conducted nine days later. For each of the last three months, the candidates have been within two points of each other. Last month, Stevens was up two, 46% to 44%. In May, it the incumbent trailed by two. The month before, Stevens had a statistically insignificant 46% to 45% lead. Begich's current lead is the largest the race has seen since Rasmussen polling began.